Madonna, Murphy Brown, Thelma and Louise: These much-discussed media icons are the starting points of Suzanna Walter's brilliant, much-needed introduction to feminist cultural theory. Accessible yet theoretically sophisticated, up-to-date and entertaining, Material Girls acquaints readers with the major theories, debates, and concepts in this new and exciting field. With numerous case studies and illustrations, Walters situates feminist cultural theory against the background of the women's movement and media studies. Using examples from film, television, advertising, and popular discourse, she looks at topics such as the "male gaze," narrative theory, and new work on female "ways of seeing" and spectatorship. Throughout, Walters provides a historically grounded account of representations of women in popular culture while critiquing the dominance of psychoanalytic and postmodern analyses. 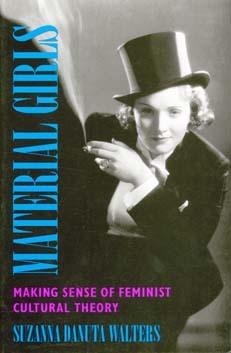 The first comprehensive guide to the approaches and debates that make up this growing field, Material Girls belongs on the shelf of every cultural critic and savvy student today. Suzanna Danuta Walters is Assistant Professor of Sociology at Georgetown University, and author of Lives Together/Worlds Apart: Mothers and Daughters in Popular Culture (California, 1992).